We are based in Tunbridge Wells and have an extensive range of predator fishing products to purchase, within our online	catalogue and the product list is being expanded on an almost daily basis. 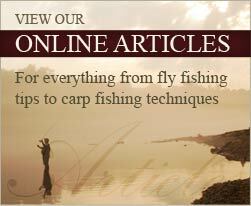 In fact we now have extensive ranges of Fly Fishing and Carp Fishing tackle available and ready to order. We are able to supply any item of fishing tackle to anyone worldwide. Just process your order as normal and out website will work out the postage at cost. look out for the golden padlock when you come to pay. GRAB YOURSELF SOME BARGAINS IN OUR MEGA LURE SALE!! We have added a new section, Freshwater Informer Lure Blog, in our articles section of our web-site to make space for the other informative articles in our Lure Section.